Home | Blog | What do I do if I’m involved in a tour bus accident or sustain an injury while sightseeing? Any vehicular accident can be extremely scary and unsettling for individual. Due to the increased potential number of injured passengers, bus accidents can be particularly tragic. Accidents, unfortunately, can happen at any time — that’s why it’s vital to know how to handle your injury claim, and what you should do if you’re ever involved in one. Bus accidents can potentially involve many injured victims and responsible parties. The first thing you must do if you’ve been involved in a bus accident is call for immediate medical attention, whether at the scene or immediately following the accident. Most states require that individuals seek medical attention within a certain period of time in order to be able to make an insurance claim. Even if you don’t believe that your injuries are very severe, make sure you see a medical provider and document every step of your treatment. Photos can be incredibly helpful to document both the scene of the accident and any injuries you’ve sustained. Who’s liable for an injury following a tour bus accident? Unfortunately, there is not a cut-and-dry answer to this question. There are so many factors at play that could skew the final result. The responsibility can be spread and passed between multiple parties. However, the main parties in a tour bus injury case typically are the bus company and the tour company and any other vehicle involved in the accident. 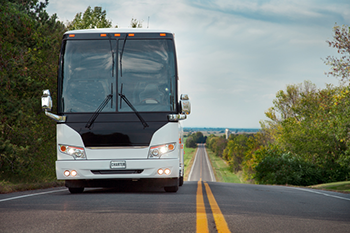 Tour bus drivers are expected to deliver the highest level of care when operating their vehicles. If you find that your bus driver was driving while being distracted, speeding, committing an improper lane change and/or displayed signs of fatigue, you need to document and report these instances. This will put responsibility on the bus company due to negligence. Tour companies have the responsibility and expectation to employ bus companies with clean records, and without any safety violations in their history. If it’s proven that a tour company was aware of any safety violations with the bus company in the accident, they will share accountability for the accident. What happens if injuries occur off the bus, but during the sightseeing trip? The first thing you should do when injured on a trip is notify someone about the incident. Track down the manager on duty of the hotel, cruise, museum or other area you’re visiting. Remember to take plenty of pictures of the scene, your injuries and any other contributing factors you come across. It’s important to do this before any cleanup is done, so as to not lose any evidence. Once you’ve sought medical care, get in touch with your insurance provider and report the incident. When you get home, you should speak with an attorney about your claim. He/she will be able to answer questions you might be having and will provide you with insight on how to handle next steps. At KBG, we have a team of experienced attorneys who can help you get the Results You Deserve® following an injury. Contact our personal injury team today.